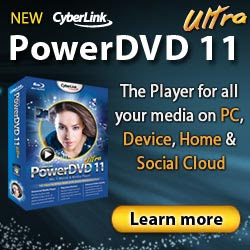 Today, CyberLink launched PowerDVD 11, the successor of the most widespread and award-winning DVD and Blu-ray player PowerDVD 10. You can find our latest review of PowerDVD 10 along with reviews of 4 other Blu-ray player software products here. In the current article we will introduce the new features of PowerDVD 11 and its progress towards becoming a universal player for various media playback. PowerDVD 11 is intended to be your general player for viewing DVD and Blu-ray movies, photos, videos and listening to music. Similarly to its predecessors version 11 continues its expansion toward online experience and in addition to the playback of online content, it offers support for transfer and playback of content from smart devices. Whatever niche there is digital entertainment involved in, CyberLink's video player tries to cover it. Of course, it does not play "any media format from any device" as it is advertised but this is also valid for any other media player so let's forgive CyberLink for the exaggeration. You can play and transfer content from portable devices. Support is offered for Android-based devices and for Apple's iPhone, iPod Touch and iPad. You can use your smart device as a wireless remote control for PowerDVD 11 player with the help of a device application called PowerDVD Remote. You are able to control remotely the playback of your DVD and Blu-ray movies, videos, photos and music. You can zoom or rotate photos from a distance as well as using your device in the form of a wireless mouse pad. You can use the player for photo viewing of JPG, TIFF, BMP, PNG, RAW, etc. You have the possibility to play media files from remote sources either being DLNA servers or social networking sites like Facebook, YouTube and Flickr. You can also upload videos to YouTube directly from PowerDVD as well as commenting on photos and downloading them from Facebook and Flickr. The 3D features have been enhanced. You can play Blu-ray 3D movies and there is a native 3D video support. You can see significant improvements in the 2D to 3D conversion introduced with the previous release. Conversion of 2D Blu-ray discs is not supported although it has been expected but the feature is working for DVDs and video files including 1080p M2TS so the 2D to 3D Blu-ray conversion could be added in the near future. You can also apply the 2D to 3D conversion to images. PowerDVD 11 uses TrueTheater™ to upscale all your video content to near HD quality. You can make your home videos look better with the help of TrueTheater. It is able to remove noise, to enhance details and brightness and to stabilize shaky picture. There is new Ultra-fast Instant Seek that allows you to search your DVDs very fast for a scene you want to watch. As with the previous releases, version 11 offers a very vast video format support, including MKV (H.264), WTV, FLV (H.264), MOV, External Subtitle, 3GP and 3G2. BDMV (Blu-ray folders) playback is here once again after being removed in a previous version. Device auto-detection has been improved. CyberLink offer PowerDVD in 3 versions as usual. PowerDVD 11 Standard is the cheapest one with the price of US $49.95 and of course it is the version with most limited options. If you want 3D support you will need at least PowerDVD 11 Deluxe which is priced at US $69.95 and for Blu-ray and Blu-ray 3D playback you have to purchase the most expensive PowerDVD 11 Ultra version for US $99.95. All versions including upgrade possibilities at reduced prices and free trials are available here. CyberLink's PowerDVD Remote is available at the Apple App Store and Android Market. It costs US $4.99 for PowerDVD Standard version users and it is free for users of PowerDVD Ultra and Deluxe versions. Check for PowerDVD 11 discount codes by following the link. Browse our Review Maze to read more software reviews.